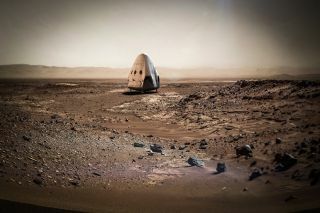 This SpaceX conceptual illustration depicts how the private spacecraft company plans to send their Dragon capsule to Mars. Image released Sept. 14, 2015. If Elon Musk's SpaceX can get to Mars and bring samples back to Earth before the United States can get there, it would be cause for celebration not lament, said NASA's new science chief. "If Elon Musk brought the samples in the door right now I'd throw him a party out of my own money," Thomas Zurbuchen, NASA's newly named associate administrator for science, told reporters Monday. "I think that would be a huge success out of the strategies that were pursued by this administration of helping … the private industry to really grow capabilities that 10 years ago were not around," he said. During his first sit-down with journalists, Zurbuchen also said that polarizing topics, including science issues, need to be tackled with empathy for and patience with people who have opposing viewpoints. "Just because somebody doesn't agree with us the first time we open our mouths doesn't mean that they're stupid, or we're smart, or the other way around. I think it's really important to create, bring some empathy to the table," Zuburchen told Seeker. "There's a lot of stuff that can be learned by just talking to people." Before joining NASA Zurbuchen was a professor of space science and aerospace engineering at the University of Michigan in Ann Arbor. His areas of expertise include solar and heliospheric physics, experimental space research, innovation and entrepreneurship, NASA said in a statement. Zurbuchen holds a master's and a doctorate in physics from the University of Bern in Switzerland. Zurbuchen succeeds acting Associate Administrator for Science Geoffrey Yoder, who is retiring from NASA in December. Yoder took over when John Grunsfeld, a former astronaut, retired as NASA's chief scientist six months ago.